Coating mold components like ejector guide elements, cores, lifts and cavities increases the lifespan of molds while reducing maintenance and running costs. It is for this reason that injection molders are turning to a variety of coatings to protect their investment and reduce maintenance and running costs. 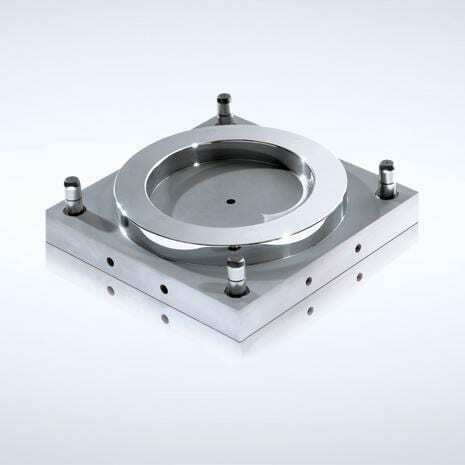 These coatings, applied to mold cavities as well as moving, sliding components within the mold, come in a variety of styles from carbon-based coatings, PVD & PACVD deposition to nitriding techniques that share one overriding goal: hardening the surface of the steel to protect it against all manner of abuse. “Inside the mold there is more pressure and higher temperatures being used to inject the plastic by a factor 2-4 times higher than in the past,” explains Vermland. This inevitably creates more friction (sheering effect) which can cause polymers like polyethylene or a polypropylene to become unstable during crystallization. To compensate, reinforced glass fibers are often utilized as an economical way to create a lighter, stronger part that retains some flexibility. However, the long glass fibers popular today are more abrasive, resulting in micro cutting within the mold’s cavities and runners due to sharp, jagged edges and a hardness of up to1200 HV. This can create significant issues, particularly along the parting line and any sharp contours within large molds. Vermland says Oerlikon Balzers’ BALINIT PRIMEFORM diffusion treatment increases injection mold surface hardness up to 1400 HV. This makes the molds significantly more robust (including versus long glass fibers) and reduces residue build-up, spalling and edge embrittlement. Vermland adds that a large steel mold of 65 HRC could not even be manufactured due to its size. With the surface now harder than that of the glass fibers and any additives, repairs and re-polishing are reduced as much as 80%, according to some customer experiences. The BALITHERM PRIMEFORM diffusion treatment is also ideal for automotive plastic parts with mirror-polished surfaces, such as those used to produce bumpers headlights, tail lamps, and brake lights or large interior parts with high quality demand like piano black. The mirror-polished surfaces of plastic injection molds are very sensitive and so require more surface cleaning, and protection. Failing to do so can allow dust and other particles into the mold that influence the quality of the end product. With its superior polishing properties, BALITHERM PRIMEFORM improves surface brilliance and eliminates the need for mirror re-polishing after cleaning. In this way, heavily stressed areas are rendered wear resistant and are protected against scratching, environmental factors and improper handling. “When you apply carbon-based coating to these types of components, you can extend service life, enable longer runs between repairs and increase performance,” says Vermland. Carbon-based coatings such as BALINIT C, BALINIT TRITON or BALINIT DYLYN from Oerlikon Balzers, are thin (approximately 2 – 3 microns) and provide extremely hard layers to the surface of components and cavities. The most critical advantage of PVD coatings is its ability to increase wear resistance over uncoated steel. In fact, all PVD coatings are harder than the steel onto which they are being applied. This hardness and wear resistance is particularly effective against high-filled glass resins and corrosive gasses, emitted by polymers such as PVC. Another reason injection molders employ Carbon based coatings is because of its lubricity, which provides sliding wear resistance for slide-type components like ejector pins, subsequently, protecting them against seizure and corrosion. This lubricity also facilitates the plastic flow, allowing for faster mold filling without the use of internal lubricants and release agents. Because the plastic meets less resistance during injection, less pressure is required. The result is a higher quality end product. For optimal results, Vermland suggests any customers decide on the coatings for a specific application before choosing the type of steel. Customers often base coating choices on the steel and heat treatment when it should be the other way around.